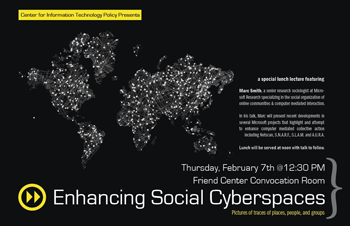 Special CITP lunch lecture by Marc Smith, a sociologist studying online communities. The Microsoft Research Community Technologies group focuses on the study and enhancement of computer mediated collective action systems, now sometimes called social media or Web 2.0. In this talk I will present recent developments in projects that highlight and attempt to enhance computer mediated collective action: Netscan, S.N.A.R.F., S.L.A.M. and A.U.R.A. Welser, Howard T., Eric Gleave, Danyel Fisher, and Marc Smith. 2007. Visualizing the Signatures of Social Roles in Online Discussion Groups. The Journal of Social Structure. 8(2). Marc Smith is a senior research sociologist at Microsoft Research specializing in the social organization of online communities and computer mediated interaction. He founded the Community Technologies Group, part of the Internet Services Research Center at Microsoft Research. He is the co-editor of Communities in Cyberspace (Routledge), a collection of essays exploring the ways identity; interaction and social order develop in online groups. 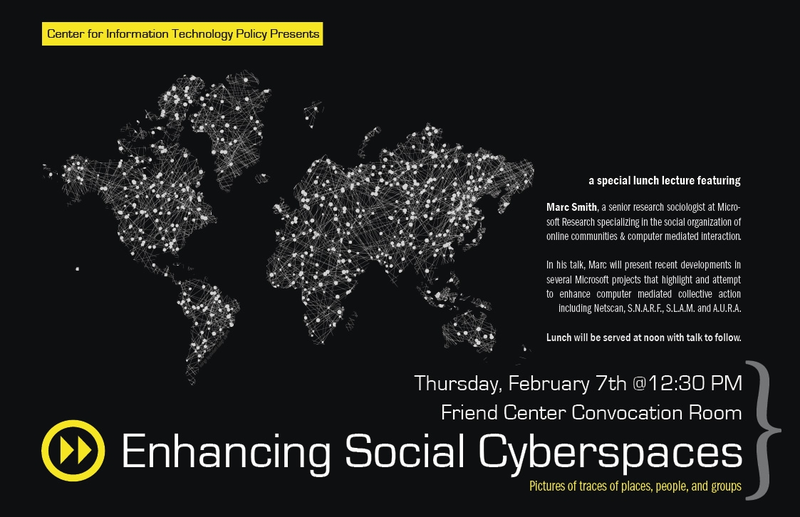 Smith’s research focuses on computer-mediated collective action: the ways group dynamics change when they take place in and through social cyberspaces. Many “groups” in cyberspace produce public goods and organize themselves in the form of a commons (for related papers see: http://www.research.microsoft.com/~masmith). Smith’s goal is to visualize these social cyberspaces, mapping and measuring their structure, dynamics and life cycles. He has developed a web interface http://netscan.research.microsoft.com) to the “Netscan” engine that allows researchers studying Usenet newsgroups to get reports on the rates of posting, posters, crossposting, thread length and frequency distributions of activity. This research offers a means to gather historical data on the development of social cyberspaces and can be used to highlight the ways these groups differ from, or are similar to, face-to-face groups. Smith is applying this work to the development of a generalized community platform for Microsoft, providing a web based system for groups of all sizes to discuss and publish their material to the web. Smith received a B.S. in International Area Studies from Drexel University in Philadelphia in 1988, an M.Phil. in social theory from Cambridge University in 1990, and a Ph.D. in Sociology from UCLA in 2001.